As the population ages, that burden is set to grow. Public funding of brain research in Europe amounts to 0.2%, and industry funding to 0.8%, of the annual cost of brain diseases. If Europe is to meet the challenge of brain disease, it needs to invest more in brain research, and to promote greater collaboration between countries, as well as greater collaboration between industry, academia and patient organisations. Brain research has been specifically identified in the EU’s Seventh Framework Programme, FP7, which will run from 2007 to 2013. In order to show what can be achieved with increased resources, the EBC has developed a Consensus Document on European Brain Research. In this document, brain research is described under 45 main headings, each spanning from a human disorder to its basic mechanisms. We suggest that the document serves as a foundation for the development of national plans for brain research, so that these can be coordinated with that of the EU and with those of other countries. 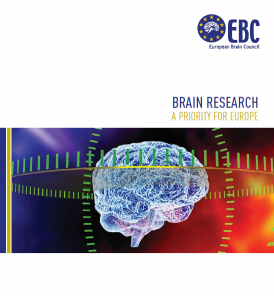 The present document summarises three publications produced by the EBC since 2005: Cost of Disorders of the Brain in Europe, Resource Allocation for Brain Research in Europe and Consensus Document on European Brain Research. Anyone wishing to read these documents follow the link here. See the full EBC Publicity Summary Document.